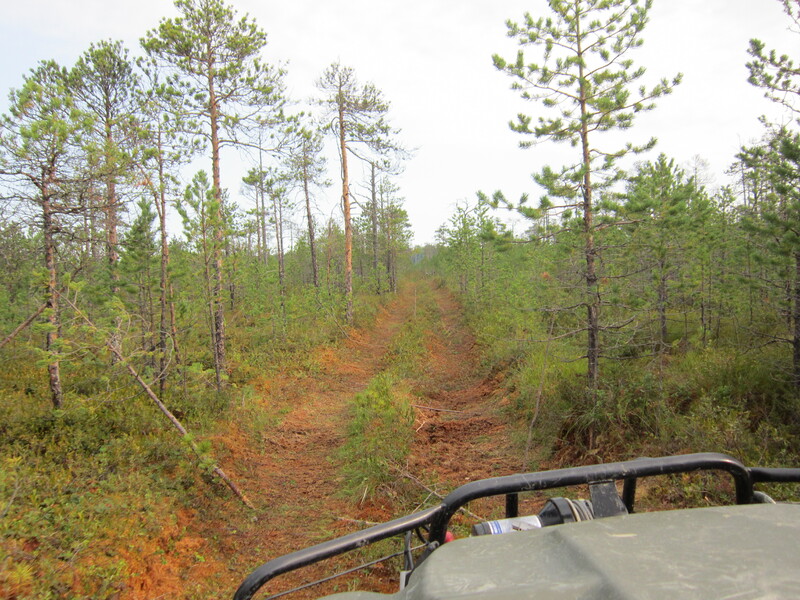 After arriving back in Shapsha field station, we discussed where best to sample Scots Pine near Khanty-Mansiysk. The predominant pine species in this area is Pinus siberica, the seeds of which are also used as a food source, and Pinus sylvestris is therefore a marginal species, restricted again to forest edges and ryam. We found one site near to the field station and then another in the forest which is in the centre of the city. The forest covers a hill (the only hill for miles around!) and Scots pine clings to the edge of a precipitous slope, on a gradient of about 40°. We scrambled up the dusty path and then made our way back down, sampling the huge trees as we went. The views from the top were fantastic, with the Irtysh River and the Archaeo-park’s bronze Mammoths and other sculptures below. 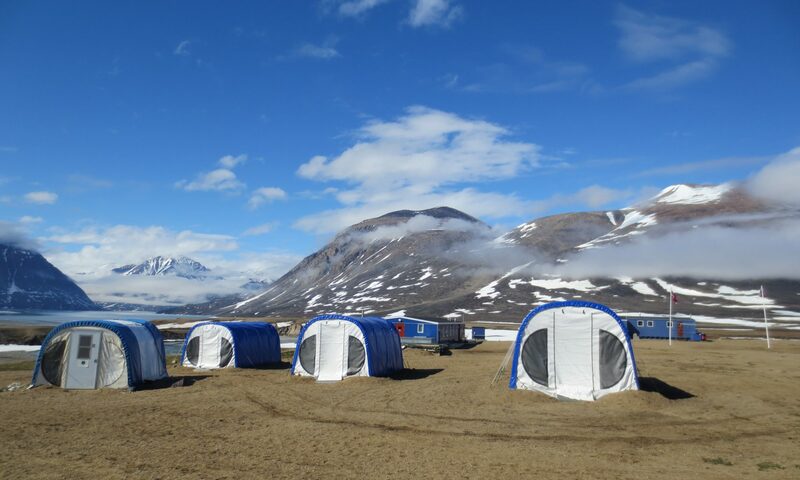 We managed therefore to get another couple of good collections to round off our fieldwork – we were really pleased to have achieved so much, and to get good quality mapped samples from so many locations. The following day was spent at Yugra State University, meeting the Vice-Rector and being shown around the lab facilities. We were told a little bit about the work that they do, and were impressed by the size of the University and the quality of the labs and instruments. So after a packed schedule, visiting three field stations and collecting over 400 samples, we set off back to the UK. The whole process went very smoothly, and apart from spending far too much time sitting around waiting in various airports it was a hassle-free day of travelling. And we even got to watch some of the Olympics in Moscow Airport! We all had a really enjoyable time, and would like to thank everyone who helped us and who made our trip to Siberia so successful, with special thanks to Elena. We met Yaroslav in his car by the road and started our journey to Kondinskie lakes nature park to the west of K-M. The journey of 400km was uninterrupted by towns or villages, and after good quality road for the first couple of hundred km, it changed to concrete and then sand which made for a bumpy ride! The forests en route are vast, with flood plains and raised bogs occasionally in sight. But mostly A LOT of trees… We stopped a couple of times to collect some pines by the road side, and noticed smoke in the distance several times which shows how close the forest fires can be. There was quite a lot of evidence in various forests of fire, with blackened trunks and a lack of younger generations, but to see it comparatively close is sobering, and a reminder of how little can be done to prevent them. Arriving at the Kondinskie field station we dropped off our bags in an impressive log-cabin (with space for 40-50 people) and headed straight out to collect samples from a lichen forest and a green moss forest. The lichen forest was eerily beautiful, with a carpet of pale green lichen which was crunchy underfoot. We realised also how easy it is to get disorientated in these forests, although we made it back to the car with the help of a GPS, a beeping horn and some logic! Lichen carpets the sandy forest floor, with only cow berries and Scots pine also able to grow in these nutrient poor conditions. The green moss forest was very impressive with enormous straight-trunked trees (see photo) looming over us as we collected cambium. We stopped near one of the lakes and walked out to take a look, and went for an impromptu swim. It was very refreshing after a hot day in the car and collecting samples, although at a maximum of 1m deep was quite an odd experience! The field station has a big banya (and they are building another) and we all got a chance to get clean before having a late dinner. The following day we did a quick collection in ryam near the field station, and then went for a walk to a river nearby. We walked across boardwalks through the ryam and then crossed ‘islands’ of forest to reach the river. There is a religious site nearby and the area is very peaceful and beautiful, with the meandering river linking two of the lakes. 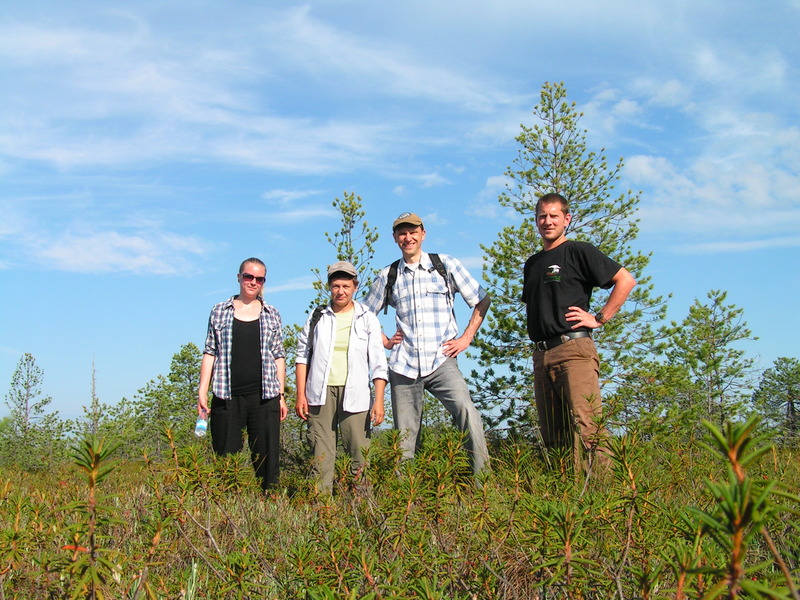 We ate delicious cowberries and blueberries on our way back which are found in abundance all over the ryam. After lunch we set off to Khanty-Mansiysk, where we arrived in the evening back to Wifi and phone signal! 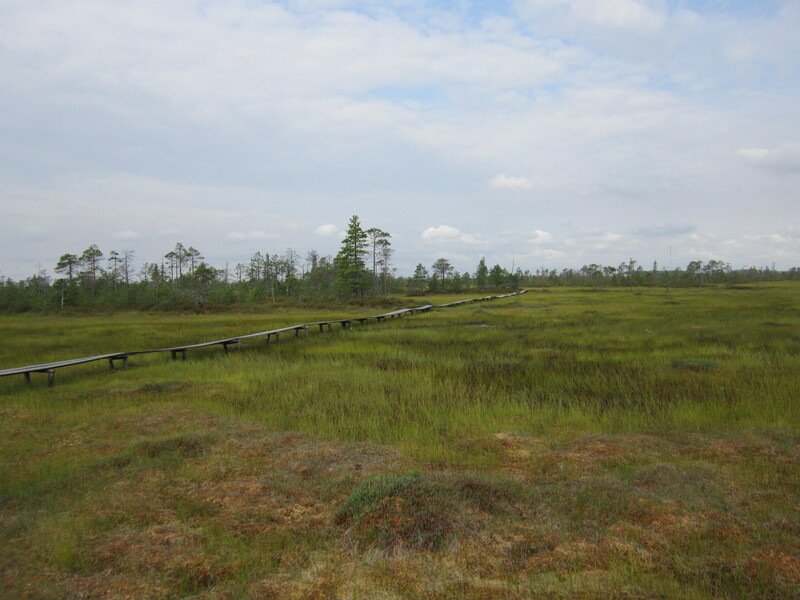 We spent the first morning at Mukhrino walking around the raised bogs (the word belies the beauty of them – see the photo) on wooden boardwalks and learning about the work that Elena, Nina, Nadia, Ilya, Evgeniy and Yaroslav do when they come to Mukhrino. They visit at least every week, and a lot of time and effort has been put in to make the place welcoming and comfortable. 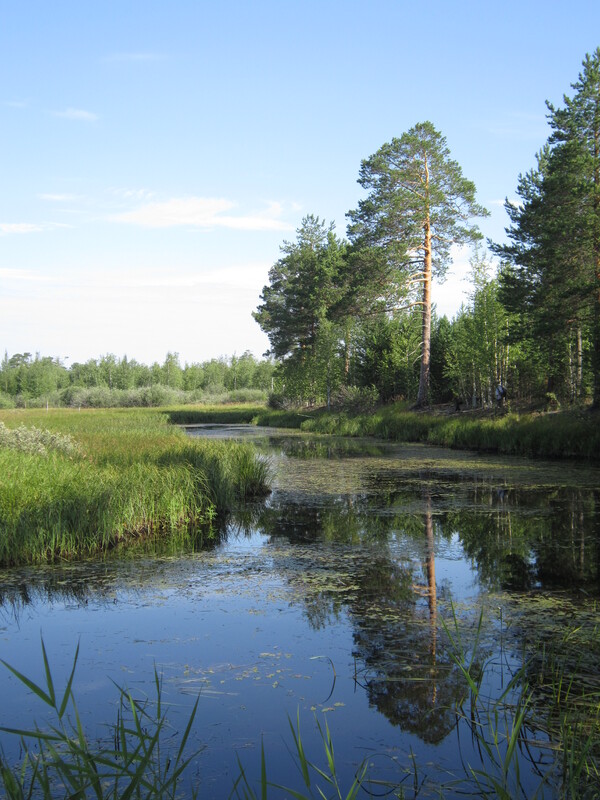 Elena explained about the ‘ryams’ – raised bogs that are a feature of this area. They are composed of a complex mixture of lichen, moss, shrubs and dwarf Pinus sylvestris – which is what we have come to collect. The pines are very small, but apparently very old, and the roots lie many feet below the surface. There is evidence of succession with a range of sizes and ages. 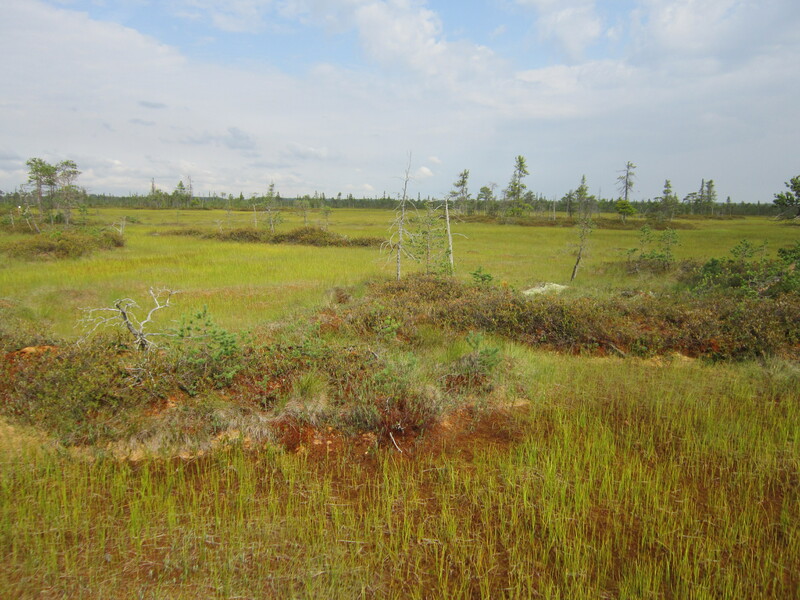 There are also subtle differences in the structure and composition of the ryam as the peat depth decreases towards the edge of the bog where the forest begins. We sampled from four plots to include different stages of this transition, mapping 50 trees in each and collecting cambium (the living layer of tissue between the bark and the wood) or needles if they were in reach. We managed two plots in the first afternoon, working quickly once the needles were in reach (see the other photo). 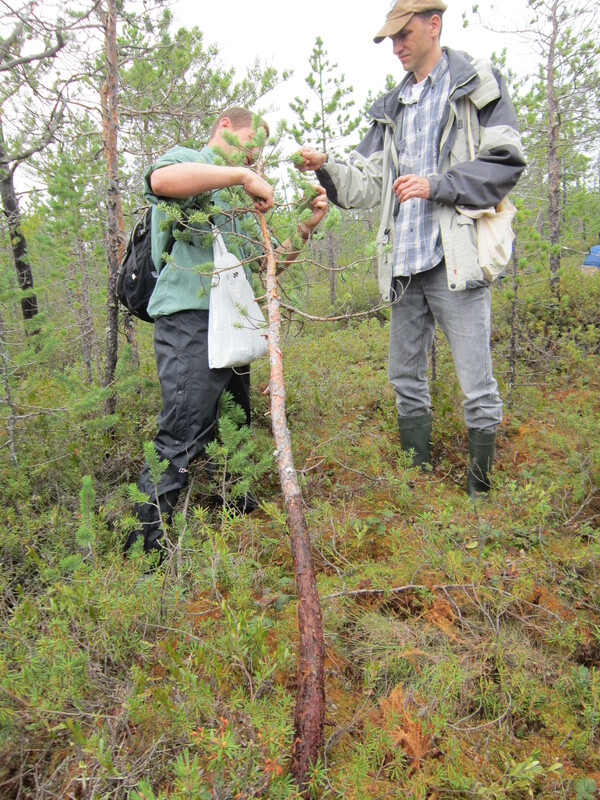 This pine is one of a number that have been used to calibrate the age of the trees we have been collecting from, by comparing the age (number of rings) with the diameter of the main stem. 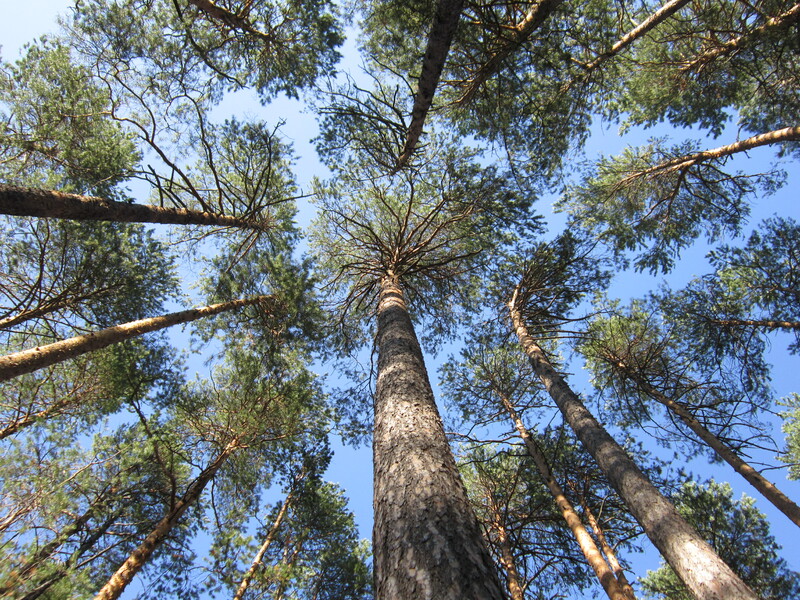 Although small, these pines are very old – this one is probably much more than 50 years old. Notice where the trunk is wet – all of this is below the surface of the bog. In the evening there was a massive downpour and thunderstorm which meant that the following day was nice and cool with a pleasant breeze which kept off the worst of the mosquitoes while finishing off the last plots. We spend most of the first couple of days travelling… After leaving Edinburgh at 8am on Friday, we arrived in Moscow, via Heathrow, at 6pm (+2 hours BST) and waited in the very hot and busy Domodedevo airport for over 5 hours until our domestic flight to Khanty-Mansiysk. Khanty-Mansiysk is in West Siberia and is nearly 3000 km from Moscow. We arrived on Saturday morning, 6am (+5 hours BST) to be unexpectedly greeted by our colleagues from CEH and Forest Research, Jill Thompson and Mike Smith. They were at the airport after a few days in K-M and were heading on the next leg of their journey to Spasskaya in the east of Russia. We were collected by Evgeniy who drove us to Shapsha field station where we were shown our rooms and given a chance to catch up on some much needed sleep! Feeling a little refreshed after a short rest, we met with Elena Lapshina, who is the Station Manager, and discussed what the field stations we planned to visit were like, and what the best plan for the next week would be. 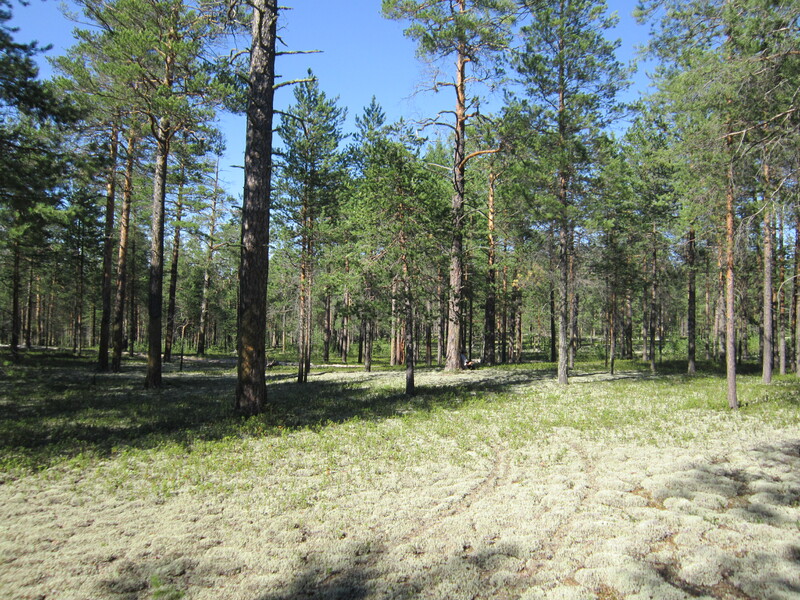 Our primary collection is a fine scale mapped population of Pinus sylvestris in the peat bogs near to the Mukhrino Field Station. 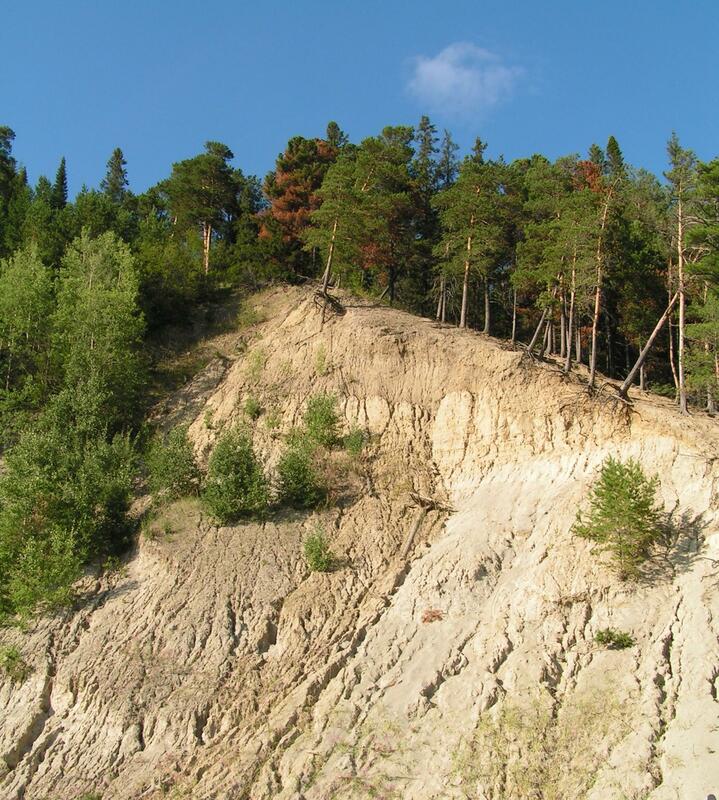 This site is south-west of the town of Khanty-Mansiysk, and is approximately 10 km from the nearest road. In the Winter it is reached by snow-mobile, and in the Spring/Autumn by boat along the river. However after the driest Summer in 150 years, the water level is too low to go by boat and so we walked (with our rucksacks collected later by the argocat). It was a beautiful walk across flood plains, through pristine forest and over occasional shallow streams. We saw lots of wildlife including a badger, red squirrels, lizards, an adder, a water-rat, butterflies and lots of mosquitoes and other irritating winged creatures… The field station is in a wonderful location, and is utterly tranquil. It even has a banya (sauna) which we were encouraged to use every evening! Although remote it does have wifi, although this relies on a wind turbine (which isn’t currently working) or solar panels. Alternatively there is a generator although there were some problems with this also while we were there. However the long light evenings mean this isn’t a big problem and apart from an inability to reliably communicate it didn’t impact at all. 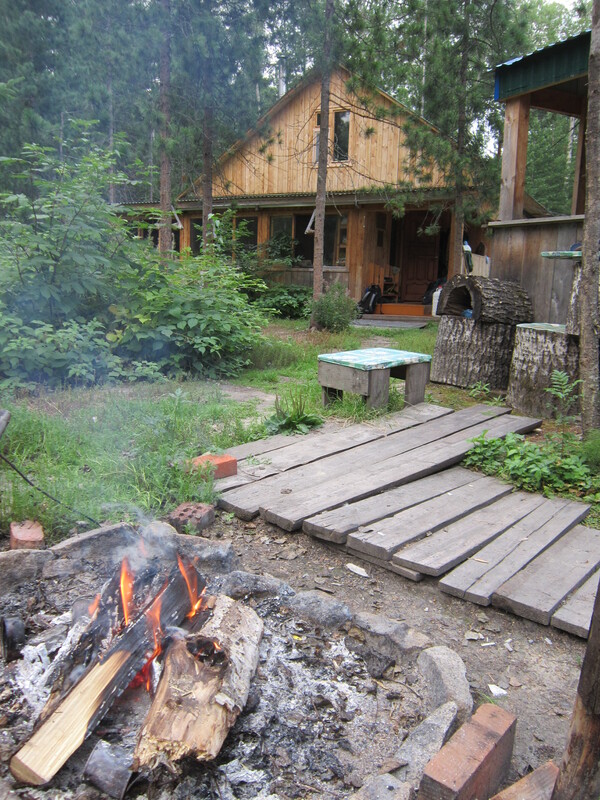 After a long couple of days we were given the chance to relax for a few hours, drinking beer by the fire after using the banya, and eating delicious home-made soup.